Pineapple Cake is a cake that looks like a pineapple! This is the EASY way to make a pineapple cake for a pineapple party! A frosted 2-layer cake with yellow rosette swirls is a fun cake decorating idea, don’t you think? Imma start off this post by declaring that I am definitely no cake decorator. My cakes rarely become the vision in my head and 99% of the time I am disappointed in the outcome, which is why I never post decorated cakes here on the blog. In fact, my inability to create a straight or prettily decorated cake is why I primarily make naked cakes. Even though I’m always adding extra frosting and cake pieces to make my layer cakes level, I am still asked (quite often) to make cakes for friends. I don’t sell my desserts or do catering at all; that’s way too stressful for me. What I don’t mind doing, however, is making a birthday cake or treat now and again. If I can take the load off a friends shoulders when they’re planning a birthday party and volunteer to make a yummy cake, why not? Normally, it’s easy and I don’t have to worry about photos or video, because I know I’m (1) not going to get a slice shot and (2) it’s probably not going to be good enough for the blog anyway. And then a friend asked me to make a Pineapple Cake. 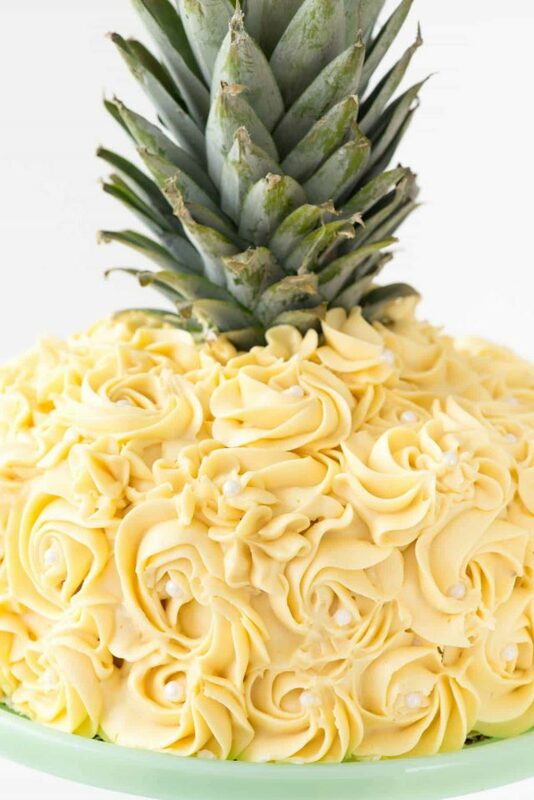 Making a Pineapple Cake Decoration is EASY and anyone can do it. Pineapples are totally HOT right now, if you didn’t know. They’re allllll over the party sections at Walmart, Target, and Party City, and pineapple cakes and cupcakes are hot commodities on Pinterest. One of Jordan’s good friends was having a birthday party last weekend and her mom wanted a pineapple shaped cake. I told her, in no uncertain terms, that there was no way I would be able to make a cake in the shape of a pineapple. So I hopped on Pinterest and found a cute emoji pineapple cake and sent it off to the mom. She loved it, but the daughter wanted something a little more grown up, so they sent me this pin and asked if I could do that. Uh, DUH I could. A rose cake is, quite literally, the only cake decoration I can do. The only difference between this and a traditional rose cake? The pineapple topper! There is a video above the pineapple cake recipe, so if you want a full visual on how I created this cake, check it out. 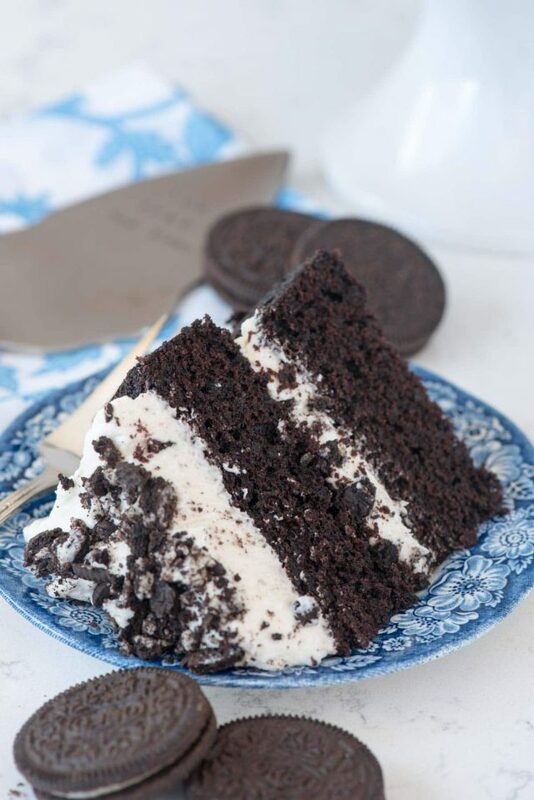 Basically, you start with a 2-layer cake. You can use any flavor combo you want, with any filling. I used i am baker’s white cake recipe, which really is the BEST. It was SO good (I ate the leveled off parts). Then I filled it with lemon curd. You can fill it with the frosting too, if you prefer. Sky is the limit. This recipe is really just the DECORATION (and I gave you a recipe for my easy buttercream too). The buttercream is my favorite frosting recipe. It’s easy to make and the perfect balance of buttery sweet. Tint the frosting yellow to make it look more pineapple-y. 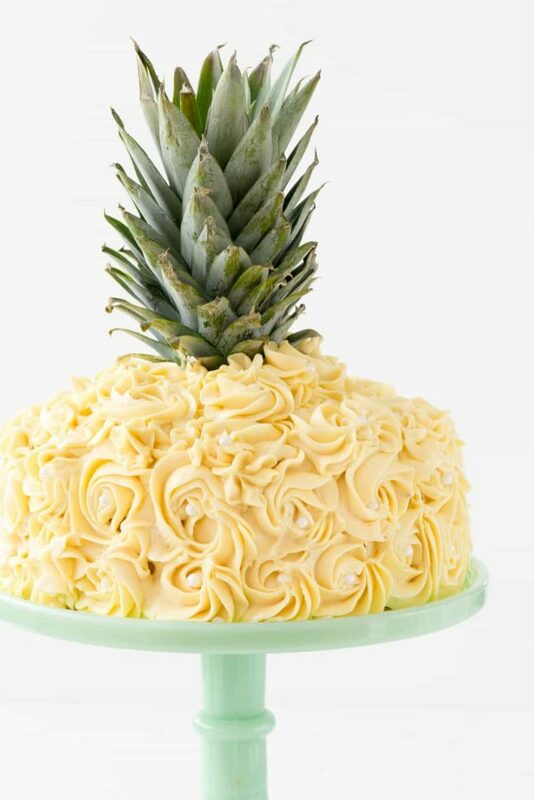 The hardest part of this cake is slicing off the pineapple topper and making it straight, seriously. Wrap the bottom of the top (say what?) in some plastic wrap to protect the cake, then place it in the center. I used a 1M (Wilton Open Star) tip, and piped swirled roses all over the cake. I added some finishing with sugar pearls. This pineapple cake is one of the prettiest I’ve ever made. Obviously so, because it made it to the blog! It would be great for a baby shower, bridal shower, wedding, or birthday party. To make it cute for a little kids birthday, just get some black frosting and pipe a face on it for an EMOJI pineapple! Pineapple Cake - this is the EASY way to make a pineapple cake for a pineapple party! 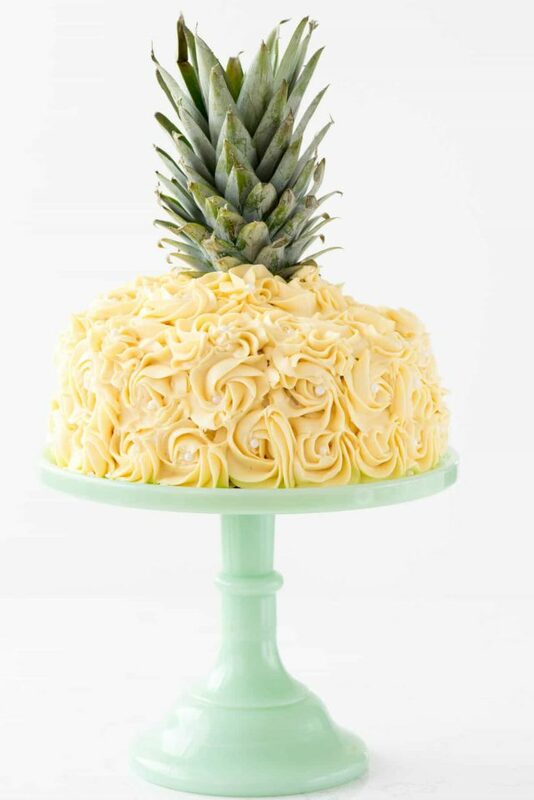 Simply frost a 2-layer cake with yellow rosette swirls and you have a pineapple cake EASILY! Make the buttercream: beat butter until smooth in the bowl of an electric mixer. Slowly add powdered sugar, 1 cup at a time, until crumbly. Add vanilla, salt, and 1-2 tablespoons of heavy whipping cream, then mix until smooth and creamy. Add more heavy whipping cream as needed (it kind of depends on how soft your butter is, the frosting needs to be spreadable). If you haven't filled your cake already: level the two cakes. Place one layer on cake plate, fill with frosting (or use a favorite filling, like lemon curd). Then frost the outside of the cake with a thin layer of frosting. This is your "crumb coat". Chill until set, about 30 minutes to one hour. When ready to do your decoration: tint your frosting the desired color yellow. Fill a pastry bag fitted with a 1M (large star) tip. Slice the top off the pineapple and level it as best as possible. Take a small amount of plastic wrap and wrap the bottom of the topper, so it doesn't get the cake soggy. Place it in the center of the cake. Pipe rose swirls (us a simple swirl motion) to create the decoration all over the cake. Because it's hard for me to be perfect, I tend to not go in rows; instead I alternate and then fill in any holes with smaller rosettes or a simple squeeze of icing. Place white pearl sprinkles around the cake in the center of the roses. Optional: Have a emoji loving kid? Skip the pearls and use black icing to pipe eyes and a smile for a pineapple emoji! Check out some of my favorite decorated cakes: Pink Ombre Swirl Cake by Glorious Treats, Rainbow Leaf Tip Cake by i am baker, or Pina Colada Layer Cake by Life, Love, and Sugar. Take it from me this was a HUGE hit! It was so pretty and so delicious! Thank you again Dorothy! IMPOSSIBLY clever. Love it, D! Do you think I could do this with a 3 layer cake? I am just not sure how much a 2 later yields and I want to make it for a party for like 20 people. This is so beautiful!!! I feel like this is soooo out of my league! Amazing job! 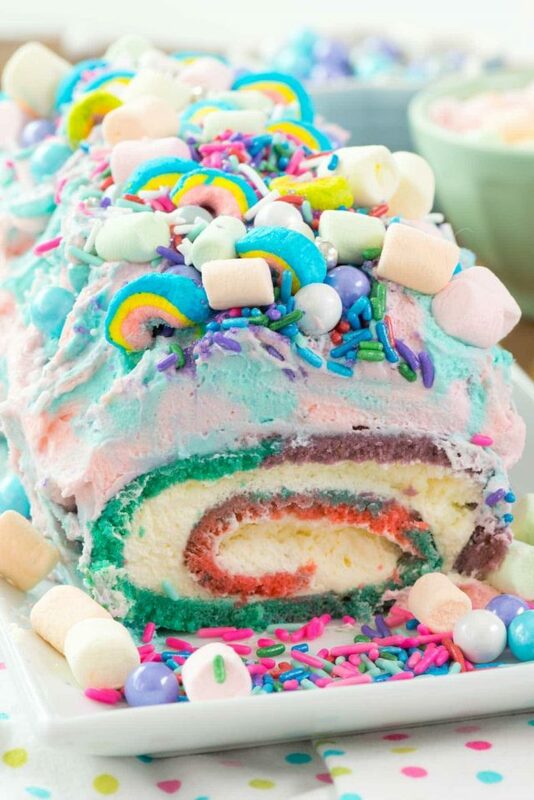 Could this cake be any cuter?! I think not. My mother would absolutely flip over it. She loves pineapple. Can’t wait to give it a try. This pineapple cake is literally the cutest thing! 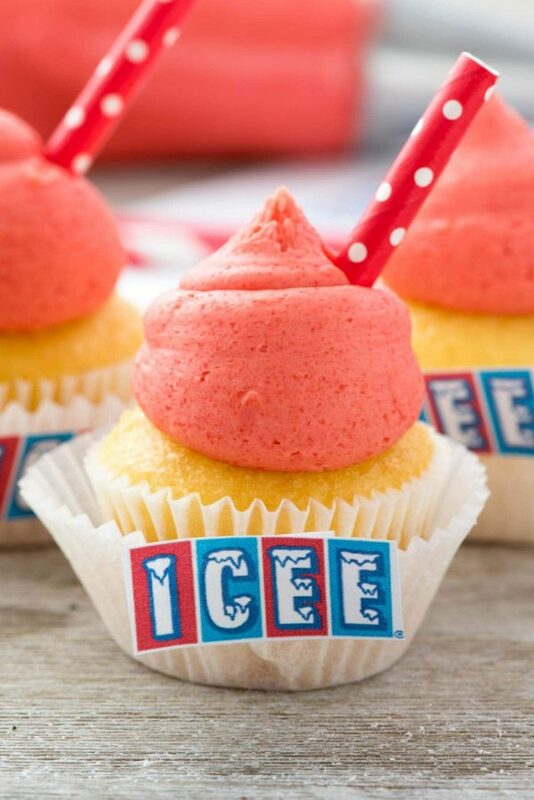 It would be such a great dessert for a beach party! It’s a beautiful idea! I love your work! Thank you for sharing the recipe! Gonna try it for summer party.